Full colour digital business cards printed using the finest quality smooth white (or cream) 330gsm card (size 85x55mm). The process rivals traditional litho, but is a much quicker turnaround. The business cards are supplied in PVC business card cases and presentation holder. This service is ideal for cards that are needed fast in 1-2 days, or you just need a low quantity. Fast turnaround business cards, printed on white or cream business card board. We print from your artwork, or we produce professional artwork for you at reasonable prices. You can choose the business cards to be printed on white or cream 330gsm card. How do I pay for full colour digital business cards? Do I need artwork for full colour digital business cards? Leeds, Bradford, Otley, Shipley, Yeadon, Guiseley, Horsforth, Pudsey, IIkley, Baildon, Bingley, Keighley, Skipton, Harrogate, Wetherby, York, Halifax, Wetherby, Huddersfield, Thirsk, Ripon, Castleford, Tadcaster, Brighouse, Barnsley, Ripon, Selby, Morley. 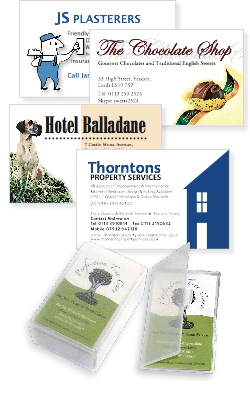 Printline Advertising is a business card printers in Leeds. We have been printing business cards in Leeds since 1999. Prices subject to a delivery charge (if applicable) and VAT - E.O.E. Same day orders Mon-Fri only subject to work load.